Robusta Blogger Template is a high quality, use-friendly, creative corporate business website. 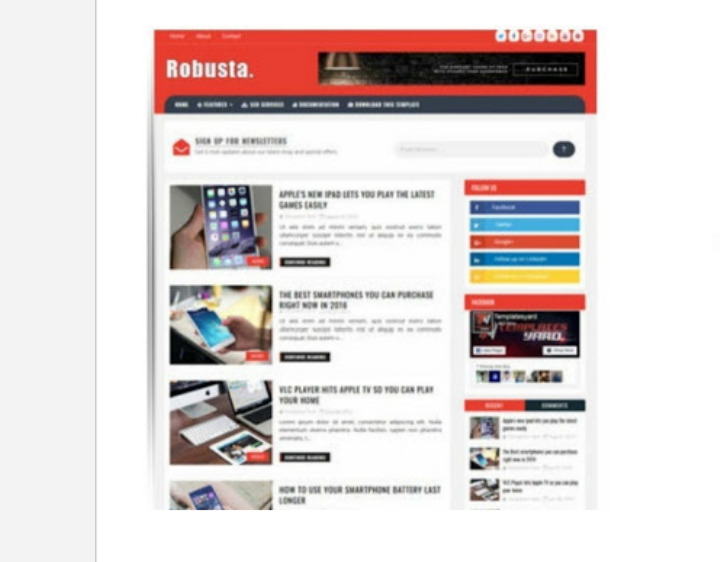 Writing blogs every day, Robusta theme is made just for you, so you can sharing about your products and so on. This is a simple blogger theme that comes with standard features. We have not added any other fancy features, as we always do with our other themes. instead we keep it a simple perspective! See more amazing features . This is a simple and content-focused blogspot theme. This is a very rich theme that aims to attract your readers. This helps you to make the reader support with the e-mail subscription box in the header. Note:- Great design.. H1 H2 tag optimized.. All in one SEO pack..
Like its name, it is a very strong theme with highly customized coding that gives you a better and more professional experience from any other blogspot model. It's designed for blogs about special news and technical magazines. great way to create news, technical and magazine blogs. This theme is growing rapidly due to its clean and minimalistic design. It provides you with a canvas so you can design any kind of design. It is a highly customizable theme with responsive layout and professional is optimized for great SEO. It comes in at least color scheme and for most clicks, there is a full white background for most elements with red in the form of action color.